The arrondissement flags were established by Royal Regulation of 3 December 1817, signed by Louis XVIII. They were confirmed in the 1852 Imperial Regulations on naval flags signed by Napoléon III and by Decree on 20 March 1868. These flags are still shown in Grand Larousse Illustré du XXe siècle (1928). They were probably abolished in 1929. A specific flag, true to the model shown in the Appendix to the 3 December 1817 Regulation, shall be assigned to each maritime arrondissement. This flag shall be hoisted on top of the mainmast. The shipowners must announce to the office of the Register of Sailors the house flags they want to use. They may use them only after their notification, which shall be registered and mentioned on the ship muster roll. The house flag shall be hoisted on top of the foremast. There are today only three maritime regions (régions maritimes), with the military ports Cherbourg, Brest and Toulon as their respective préfecture maritime. Each arrondissement was divided into two sectors, which had flags with the same colours but arranged differently. Pierre Charrié (Drapeaux et étendards du XIXe siècle [chr92]) shows a black-and-white facsimile of the plate entitled Pavillons d'Arrondissements des Côtes de France (Arrondissement Flags of the Coasts of France), from Album des pavillons, guidons et flammes de toutes les puissances maritimes (Album of ensigns, pennants and wimpels of all maritime powers) by Legras (1858) [leg58]. Charrié also gives a written description of the flags, with a few mistakes listed below. Pavillon indiquant à quelle zone militaire appartient telle partie des côtes de France, that is "Flag showing to which military zone belongs a given part of the French coasts." The flag of the Dunkirk-Honfleur sector is swallow-tailed, horizontally divided blue-white-blue-white. Redon writes "From the Belgian border" instead of the original "From Dunkirk" (Belgium did not exist as an independent state before 1830). The flag of the Honfleur-Granville sector is triangular, vertically divided blue-white-blue. Blue and white are the traditional colours of Dunkirk and Granville. Charrié erroneously writes "green" instead of "blue" for the two flags. The flag of the Granville-Morlaix sector is swallow-tailed, vertically divided blue-yellow-blue-yellow. The flag of the Morlaix-Quimper sector is triangular, vertically divided blue-yellow. The flag of the Quimper-Lorient sector is swallow-tailed, horizontally divided blue-red-blue. The flag of the Lorient-Loire sector is triangular, horizontally divided blue-red. The flag of the Loire-Royan sector is swallow-tailed, horizontally divided green-white-green. The flag of the Royan-Spain sector is green with two white triangles placed vertically along the hoist. Charrié erroneously writes "blue" instead of "green" for the two flags. The flag of the Spain-Marseilles sector is swallow-tailed, horizontally divided white-red-white-red. The flag of the Marseilles-Piedmont / Italy sector is red with two white triangles placed vertically along the hoist. Redon writes "from Marseilles to the Italian border" instead of the orginal "from Marseilles to the Piedmontese border" (Italy did not exist before 1861). - the flag of the Western colonies is quartered blue-yellow. Redon writes Ponant instead of "Western colonies". Ponant (from popular Latin sol ponens ,"setting sun"), is a mostly forgotten word for West, as opposed to Levant, "rising sun", for East; however Brest is still called port militaire du Ponant because in the past there was the flotte du Ponant, the Atlantic fleet, as opposed to the flotte du Levant, the Mediterranean fleet; Levantin is still used to design peoples from Eastern Mediterranean countries. The Echelles du Levant were the trading posts established by Christian nations from the 16th century in the Eastern Mediterranean Moslim states. The Norie & Hobbs's flag chart (1848) [noh48] shows this flag for "French Colonies, Western", whereas Bromme's Flaggen und Atlas (1862) [bmm62] shows it for Frankreich Westind. Kolonien (French West Indies Colonies). 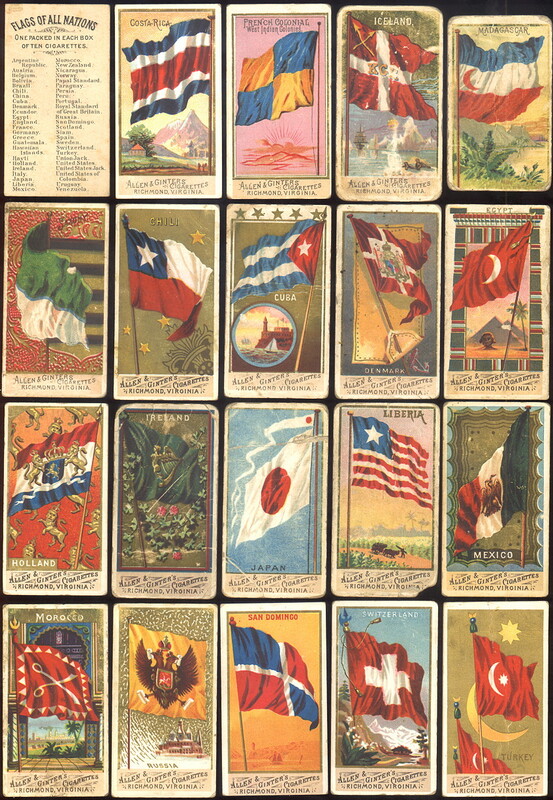 The flag is also shown on a cigarette card from the Allen & Ginter's Cigarette Cards album "N9 Flags of all Nations" . - the flag of the Eastern and African colonies is vertically divided yellow-red. Redon writes Orient instead of "Eastern colonies and Africa coast". Orient [East] is the origin of the name of Lorient, formerly L'Orient. The Norie & Hobbs's flag chart (1848) [noh48] shows this flag for shows this flag for "French Colonies, African & Eastern", whereas Bromme's Flaggen und Atlas (1862) [bmm62] shows it for Frankreich Ostind Kolonien (French East Indies Colonies). A colour plate with the arrondissement flags shows the flag of the Eastern colonies as vertically divided red-yellow. The plate is undated but shows the Imperial flag and mentions the Piedmontese border, and must therefore have been published not later than the end of the 19th century. Since it is the only source to show a yellow-red flag, we can assume that it is erroneous.